"""The KUHL RESPONSE LS SHIRT is cut from luxurious EL XUR fabric. Woven from 100% polyester microfiber, EL XUR is peached with an air texture and finished with IONIK? to resist odor. UPF 30 provides sun protection. With mechanical stretch for freedom of movement and excellent recovery, this button-down classic features two chest pockets with button closure and a hidden security pocket. KUHL signature metal buttons add stylish detail. 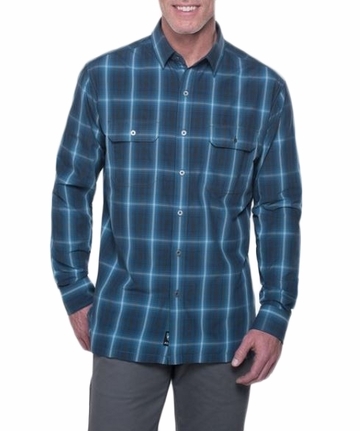 Quick dry, wicking, and wrinkle resistant, the RESPONSE LS SHIRT is perfect for travel and adventure. Easy care, wash and wear.